Imagine the joy and freedom of cruising in the fresh, open air and the roar of the powerful Mopar engine as you hit the gas pedal in a 1970 Plymouth Barracuda convertible, like this stunning blue model that’s for sale on eBay as of the posting of this article. Looking to Buy a 1970 Plymouth Barracuda Convertible? The Barracuda shown above is a rare and cool model. The paint color is B7 blue, and its 383 rallye dash has been restored. Only 3.700 miles have been logged on the car since its restoration, and the seller mentions that its 383 hp engine starts and runs great. The car has been completely detailed, and you can see in the photos in the listing that it is beautiful inside and out. The seller does note that there is some cloudiness on the rear window. 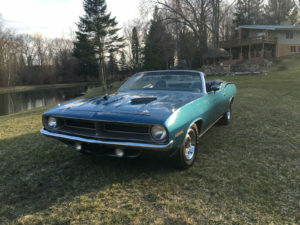 A lot of features and specifics are included in the listing for this 1970 Plymouth Barracuda convertible, and you can just click on the image or the link right under it to visit the listing if you want to see more. The body style of the ’70 Barracuda was the ‘E-body’ and while it was similar in shape to the Dodge Challenger that year, according to My Classic Garage, the Barracuda was three inches shorter in total length. Engines offered in the ’70 Barracuda started with the 225 cubic inch slant six up to the 440 cubic inch 440 V8; and transmission options in the 1970 Plymouth Barracuda included the TorqueFlite Auto and the 4-speed manual transmission. Of the 50,623 Barracudas built in 1970, only 2,500 were convertibles. Classic Cars Online US is proud to partner with eBay to bring you this information on the 1970 Plymouth Barracuda by showing you the ’70 Plymouth Barracuda Convertible in the photo.